amusedPolish: How about some spam? My first attemt at one of those foils. You know, you paint on the glue-y basecoat and the foil sticks on it. 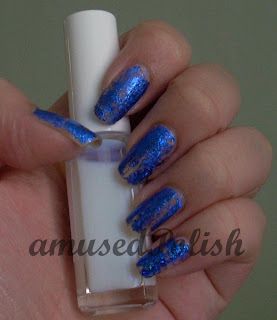 It's supposed to be a blue big chunky holo glitter. Tough it may look like a major fail, I quite like it but it didn't last long, only one day. MNY 265. A light cherry-red jelly with holo glitter in it. I used three coats and it was almost opaque with two. I like that the base color doesn't "drown" the holo-nes of the glitter because it would've been a bit dissapointing. Finger Paints Sketched and Etched. Another awesome one-coater. A magenta-ish red with pink shimmer. Milani Cyberspace layered over 4 (or better 8) of my fingers from my Jean Jacket& Shooting Stars manicure. I only used one thin coat on all fingers except my ring finger. Color Club Wild at Heart. A stunning purlpe holo. Two coats for this beauty. S-he Styelzone 206. A sheer beige-colored glas flecked polish. One coat and I didn't want to see how many coats I'd need till it's opaque. Petites Color Fever in Black Diamond. Awesome black holo. The holo is camera-shy ;). I'm obsessed with black holos. I've got way to many and am still searching for a dupe of a certain one but that company still denies "There's only one version of it". Yeah, what about the other 5?6? There's even picture proof that there are bizillion of bizillion different batches.